Is the tire flat or worn out? Chances are you just need to change the tire, not the caster (unless it is is a caster with a molded on tire). You may also just need a little air. Is the caster making noise (but the wheel and tire look good)? You probably have worn out caster bearings and only the bearings need to be changed. Spin the casters to see if they spin freely. Inspect the casters closely for hair and other debris that may be caught or wrapped around the axle preventing the casters from moving freely. If so, perform a thorough cleaning and re-check. Look at the caster forks. Are they straight and even? A bent caster fork can cause the chair to not roll easily or straight. You can give the wheelchair a shove on even ground. It should roll straight. If not, you may need caster forks instead of caster wheels. Check the caster fork. It should rotate freely without being wobbly. A wobbly caster fork usually means the caster stem bearings are worn out or the caster stem bolt is not properly tightened. You may also have debris caught or wrapped around the fork where it meets with the stem bolt. If so, perform a thorough cleaning and re-check. Taking note of the following information will make your purchase easier and less time consuming! Tire size? Wheelchair caster wheel sizes are expressed with the tire already mounted. For example a typical 8" x 2" caster may consist of the caster rim which may only be 4" in diameter and the other 4" is made up from the tire. Look on the sidewall of the tire or on the side of the caster. You may find the size you need here. It may be expressed as metric, standard or both could be printed. Many times however, the size is not printed and you will need to measure (see below). What is the hub width of your caster? Many caster wheel sizes come in several hub widths. The hub is the solid part in the center of the caster where the bearings are mounted and the axle slides through. Getting a hub that is too narrow will cause the caster forks to bend in when the axle is tightened and getting a hub that is too wide will cause the caster forks to bend outward or make it hard to mount the caster. Any of these conditions can pose a safety hazard. What type of tire is mounted to your caster? Generally, it is one of the following: molded on tire made from rubber or urethane, pneumatic tire with inner tube, foam filled tire, or urethane tire. Also note the tread pattern. What type of caster is it? 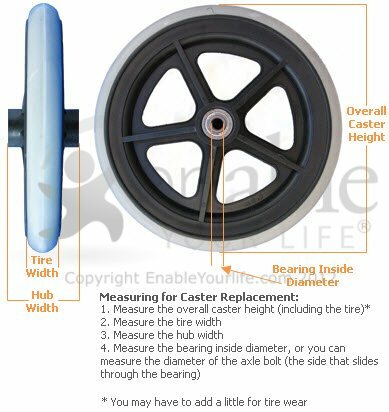 Some wheelchair casters are two piece rims plus tire, one piece rim plus tire, or one piece in total (the tire is molded onto the rim). Axle or bearing size? The diameter of your axle is the inside diameter of the caster bearing. The bearing must be the correct size otherwise your axle will not fit. You only need the inside dimension of the bearing or the axle diameter. Always purchase new bearings with new caster wheels. There is no guarantee that your existing bearing's outside diameter will seat properly inside the new caster. Plus the existing bearing has the same amount of wear as the old caster. If your caster has a spacer, that is re-usable. Installing a new wheelchair caster (with tire attached) is as simple as inserting the axle through the fork and caster bearings, and tightening the lock nut on the other side. Sometimes there are washers on the inside of the fork, on the outside of the fork, or in both places. The axle head is usually facing the outside of the chair when the chair is pushed forward. Take care not to over tighten as this can put undue strain on the bearings.